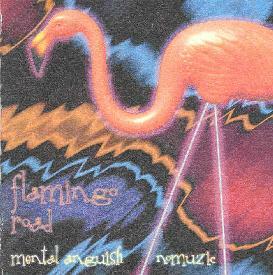 Mental Anguish & Nomuzic - "Flamingo Road"
For the uninitiated, Mental Anguish is Chris Phinney, the main man behind the Harsh Reality releases, and Nomuzic is Carl Howard, most recently of Born to Go and Land Of Guilt + Blarney fame. Flamingo Road is an album of electronic space music. But what makes these Po Boyz music special is the prominence of rhythm throughout each track. Yes, this is mucho cosmic electronica but you can just see the boy's toes tapping along continually. I'm a big fan of space electronics but I've got to say the ubiquitous percussives keep things much more lively and interesting and Chris and Carl manage to incorporate a heavy sense of beat and bounce while still making it clear that their intention is to explore the cosmos. Space electronics don't get any more cosmic than "Blast Pattern". A steady percussion beat and simple synth burps provide the backdrop for a free-wheeling electro trip through the galaxy. The duo does a good job of keeping things evolving and interesting as opposed to being a mere trippy floating electro fest, though the electronics are more the primary focus than on subsequent tracks. "Blissful In Enchantro" features a rapid whimsical synth pattern that dances about accompanied by intense cosmic spacescapes. The spacey synths get quite intense and a bit brain searing as they rise to their peak. The percussion has an almost jazzy feel which combined with the spacey synths and bouncy beat make for an interesting glom of sounds. On "The Gladiator" we get more spacescapes, a funky jam on the bells, and what sounds like might be wah'd guitar (maybe it's keyboards). "Drone Fury (The Terrordrone)" is the one track with "true" percussion, courtesy of Richard McCracken. And there's plenty of it to go with the synth excursions. And "Crying & Praying" has a steady beat and a cool space jazzy synth freakout. Chris and Carl have collaborated off and on since 1987 and are clearly operating in complimentary realms. Fans of electronic space music who are getting bored and want something a little different would do well to check this out. You can hear tracks from Flamingo Road and other Mental Anguish/Nomuzic collaborations at their Mp3.com web site. CLICK HERE to check out the Harsh Reality label profile and interview we did with Chris Phinney in issue #13. To order Harsh Reality discs you can visit their shop at the Homemade Music Store. For general information you can visit the Harsh Reality web site. Contact via snail mail at Harsh Reality; PO Box 241661; Memphis, TN 38124-1661.